Back pain is a big problem for many people: According to the American Association of Neurological Surgeons, 75 to 85 percent of Americans will experience back pain during their lifetimes. Many cases are because of stress and strain, says Gunnar Andersson, M.D., professor and chairman emeritus of the Department of Orthopedic Surgery at Rush University Medical Center in Chicago. But if you're also doing exercises that stress your back due to improper technique, back pain is even more likely. So make sure to check your form on the following popular exercises — some of which are actually prescribed to help ease back pain — or eliminate them from your workout if you're prone to back pain. If you ever experience back pain (not just muscle soreness) during a workout, it's important that you stop doing that exercise and consult your doctor or physical therapist. And if you're ever unsure of how to do an exercise properly, hiring a personal trainer for even one session can save your back from future pain. Sometimes an exercise that's designed to help strengthen the back is actually doing more harm than good. DON'T DO THIS: When you lie on your stomach and reach your hands and feet toward the ceiling, you're putting your spine into hyperextension. While this may strengthen the extensors of the back, a 2000 review in the British Journal of Sports Medicine found that spondylolysis and other conditions were closely associated with overusing back-extensor muscles, especially in an athletic population. DO THIS INSTEAD: A proper plank will help strengthen the muscles of the core and back from a neutral position, not a position of unwanted hyperextension. 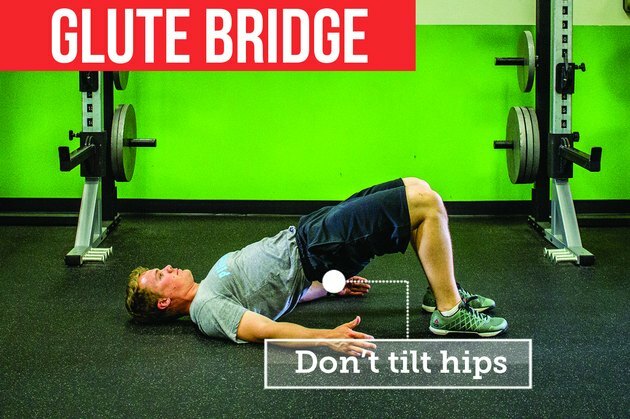 The glute bridge is another example of an exercise that's commonly prescribed to help ease back pain, but if done incorrectly, it can contribute to lower-back pain, says Conrad Stalheim, an Iowa-based chiropractor and certified strength and conditioning coach. 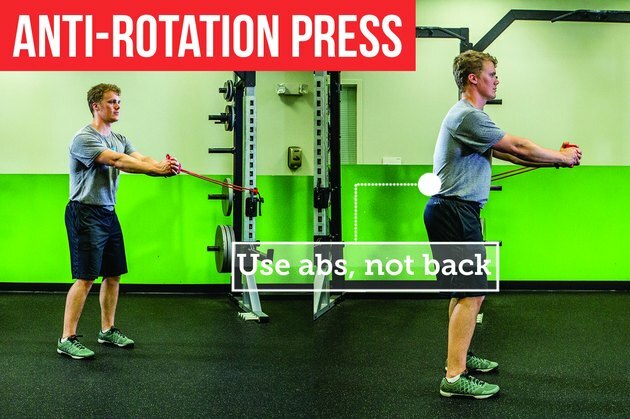 DON'T DO THIS: When you lift your hips without focusing on your core and glute muscles, it's likely you'll use the hamstrings and lower back to perform the exercise. And many times at the top of the bridge, people allow their lower back to arch or hyperextend. This can lead to overuse and lower-back pain. DO THIS INSTEAD: Lie on your back with your knees bent so your heels are a few inches from your hips. Focus on keeping your core engaged and driving through your heels as you contract your glutes to bridge your hips off the ground. Keep your back from overarching at the top by contracting your abs and keeping the hips from tipping forward. The plank is an outstanding exercise to activate the core that will help to protect the back from overuse and pain. But bad form will always ruin even the best of exercises. 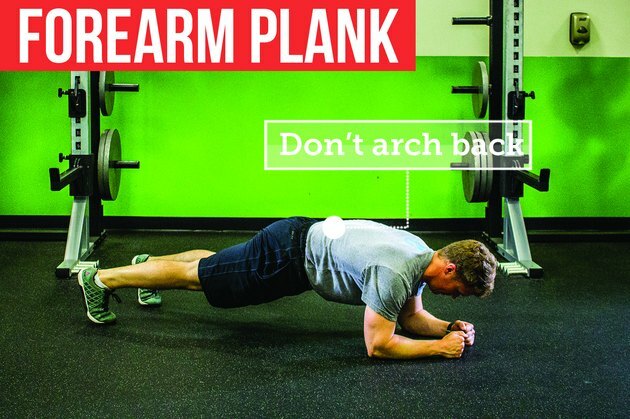 DON'T DO THIS: Planks can lead to back pain when you allow your hips to sag or rotate or your upper back to round. In these positions, the spine is hyperextended, rotated at the lower back or hyperflexed at the upper back, respectively. The further the spine is from neutral, the greater the risk of injury. Plus, when the spine and hips are out of neutral, you're not using your core appropriately, which minimizes the benefits of this exercise. DO THIS INSTEAD: Focus on keeping your hips in line with your shoulders and ankles while not allowing your lower back to overarch or your upper back to round. Imagine a cup of coffee sitting on you lower back and another one on you upper back — and you mustn't allow the cups to spill. Improper rotation of the spine can be a contributing factor to back pain and inefficient movement. 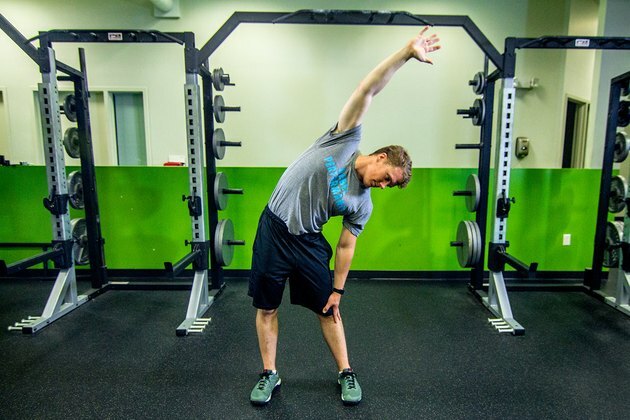 The anti-rotation press challenges your ability to maintain a neutral spine when an outside force is trying to pull you from neutral. DON'T DO THIS: Although you may be able to keep yourself from rotating as you push the cable machine handle away from your chest, if you feel the exercise working the muscles of your back rather than your core, you're not appropriately strengthening the muscles that'll help keep your back healthy. In fact, you're likely working toward overuse of the back. DO THIS INSTEAD: Contract your abdominals so you feel the tension in the abs and not the back. Keep the lower back from arching and work to keep the hips from rotating as well. It helps to imagine a set of headlights on your hips that you have to keep pointed forward. 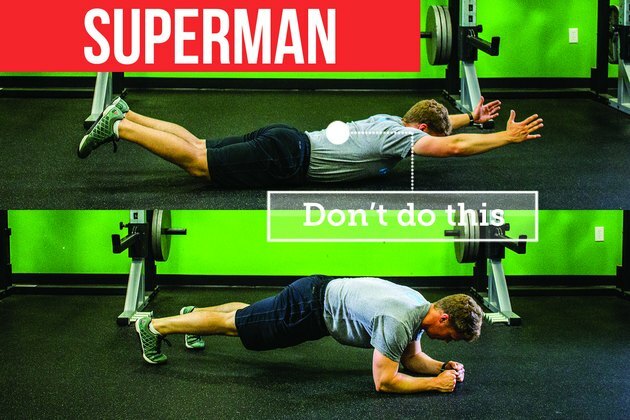 At the most basic level, the push-up is a dynamic plank. For that reason, all of the same considerations during the plank apply to the push-up. However, push-ups challenge these considerations to a greater degree, as you now have to control them during an upper-body movement. DON'T DO THIS: When the hips sag and rotate or the upper back is allowed to excessively round, there's an increased potential for back injury. It's typical for these movement flaws to occur at the transition points (starting the descent or coming out of the bottom of the push-up). 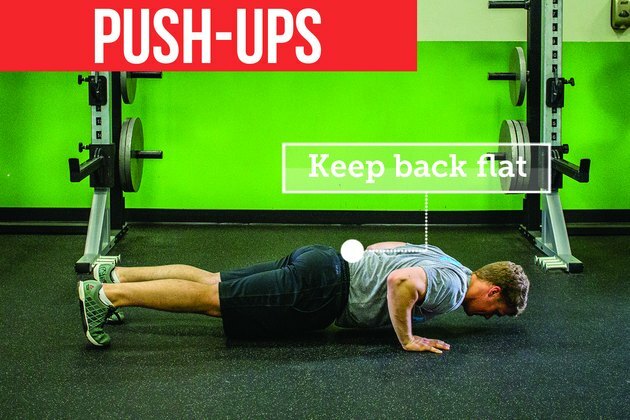 DO THIS INSTEAD: Try pausing at both the top and bottom of the push-up. Focus on the position and correct if necessary to ensure that you're not only decreasing the potential for back injury, but also reaping the full benefits of the push-up. 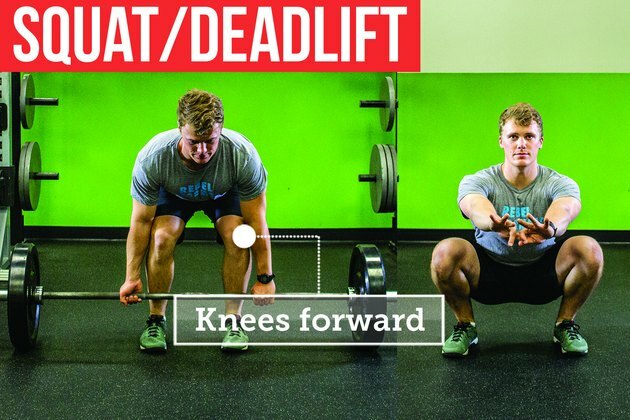 While the squat and deadlift are different exercises, when considering the potential for back injury, similar technique flaws must be addressed. DON'T DO THIS: When you squat or deadlift, if your spine rounds and extends repeatedly, especially under weight, there's a higher potential for back injury. DO THIS INSTEAD: Make sure that the shoulder blades aren't being pulled around the ribcage and you aren't hunching your shoulders or rounding your back. This will help to ensure that the upper back is kept in a good position. Next, coming up from the bottom of both exercises, make sure not to lead the movement with the chest, but instead focus on driving the hips forward. Leading with the chest causes a false swooping motion, many times resulting in excessive arching in the lower back. 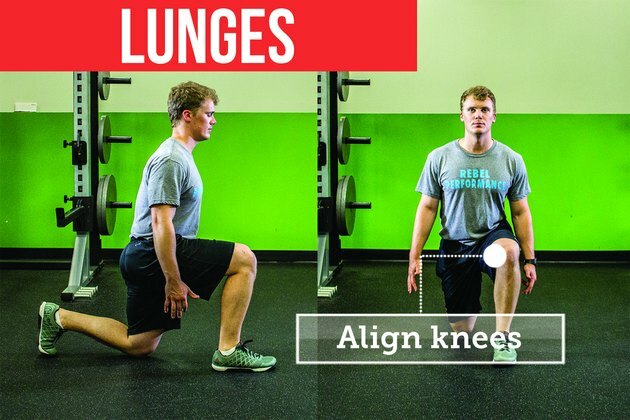 Whether you're performing a forward, reverse or lateral lunge, the same considerations for your form apply. DON'T DO THIS: Allowing the upper back to round and the lower back to overarch, especially when coming up from the bottom of the movement, will cause issues. In addition, allowing the knees to cave inward isn't a good way to keep the back healthy. When the knees collapse inward, there's a chain effect that places more stress on the hips and lower back. DO THIS INSTEAD: Contract your abdominals and keep your spine from moving out of neutral alignment. Concentrate instead on moving through the hips and keeping the knees in line with the middle toe. While you may think that upper-body exercises like the pull-up and inverted row would have little to do with back pain, a common flaw with both is overextending the lower back. DON'T DO THIS: As you initiate the pull in both exercises, there's a tendency for the hips to pop forward, arching the lower back. Taking this all the way to the top places an unnatural amount of stress on the spine, which can lead to pain and injury. 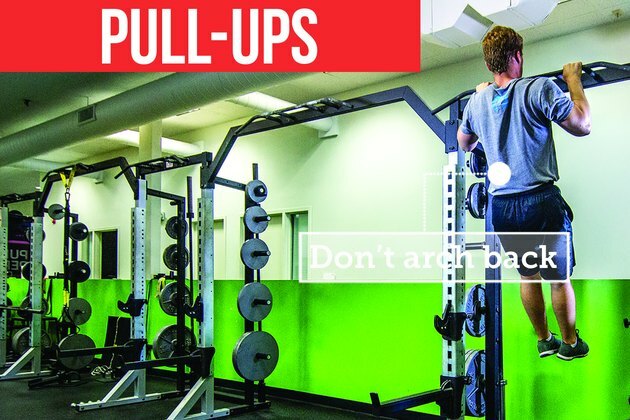 DO THIS INSTEAD: Bring your knees slightly in front of your hips during the pull-up. For the inverted row, focus on keeping your hips behind your shoulders and feet. Both of these cues help to decrease the extension force placed on the lower back and will help prevent pain and injury. The sled push is great for full-body conditioning and places less stress on the body because you can remove the eccentric action (lengthening/actively lowering) and make this more of an isometric (static) exercise. It's the eccentric portion of any exercise that usually creates the most muscular damage and soreness. 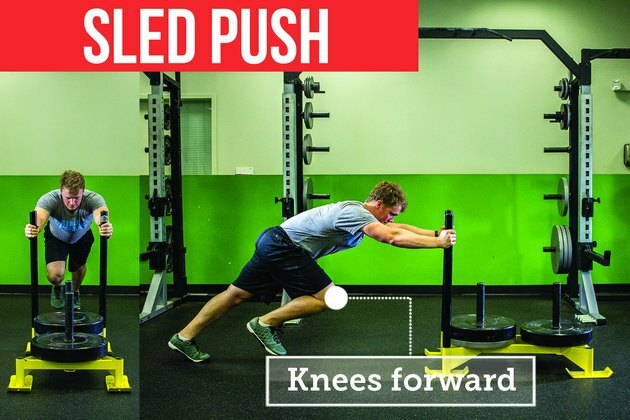 DON'T DO THIS: While the sled push is a good choice for a high-intensity exercise that is lower impact, when you let your hips shift side to side or allow the lower back to arch while pushing, you're at a higher risk for back injuries. DO THIS INSTEAD: To make the most out of the sled push and to keep your back healthy, imagine a line between the feet as you push. Do not allow your feet to cross the line as you push. Also make sure that the lower back is not overarching by focusing on keeping your abs engaged throughout the entire push. A workout gaining a lot of popularity is the battle ropes. 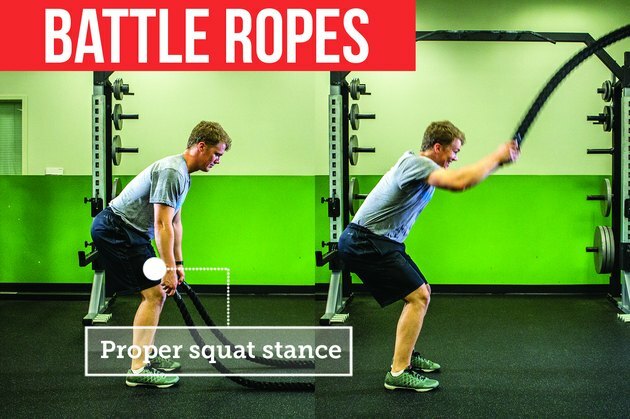 Like the sled push, when performed by someone without proper technique training, the battle ropes can result in back pain, soreness or injury. The goal when performing any exercise on the battle ropes should be to limit motion at the trunk. DON'T DO THIS: When there is excess motion of the trunk, the back is likely to be compromised. Simply focusing on moving the ropes quickly many times results in excessive motion at the hips and spine. DO THIS INSTEAD: Start with solid form — whether that's in a squat, athletic stance or static lunge position. From there, keep your abs engaged and envision yourself as a statue from your hips to your rib cage. Keep your hips from swiveling and spine from moving as you move the ropes up and down.